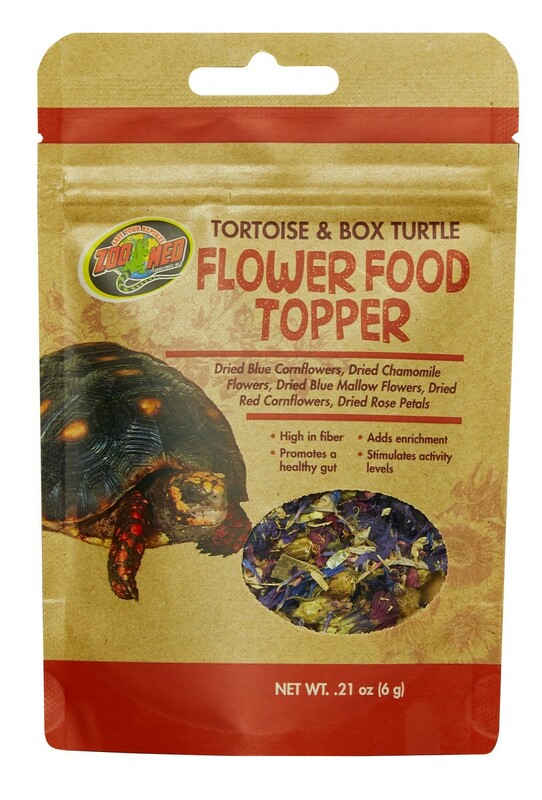 Tortoise & Box Turtle Flower Food Topper | Zoo Med Laboratories, Inc. Flowers are a natural diet item for many herbivorous and omnivorous tortoise species, nd can be fed to Sulcata, Russian, Pancake, Marginated, Leopard, Greek, Hindgeback, Hermann’s, Star, Desert, Forsten’s, Red Foot, and Box Turtles. Flowers provide a great source of fiber, minerals, and vitamins. 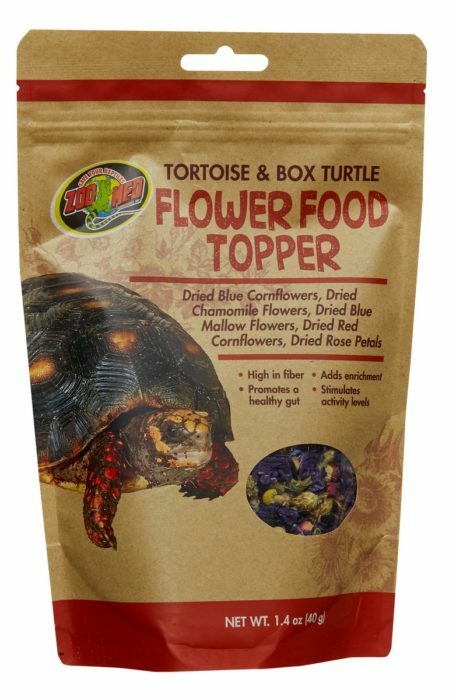 Zoo Med’s “Tortoise & Box Turtle Flower Food Topper” is a great way to add fiber to your tortoise’s diet, and to provide enrichment to their routine. Fiber promotes a healthy gut, while enrichment helps to stimulate their senses and may increase activity level. This food can be used as a topper, mixed with your tortoise’s regular diet, or spread around their enclosure. It can be fed dry or lightly misted with water (misting may cause natural pigments to seep from flowers). Provide this food in small amounts 3 – 4 times per week as a supplement to a regular diet. Always have clean drinking water available. NOT FOR HUMAN CONSUMPTION.